Few issues, in model railway circles, raise so many problems as which type of coupling to fit to the rolling stock used on a layout. 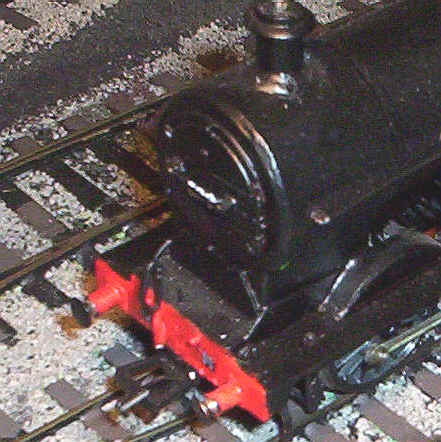 When I started to model in S Scale my initial intention was to fit Kadee buck-eye type couplings, because of their neat appearance and the positive experiences I'd had using them on my 4mm scale freight vehicles. There was absolutely no chance of me using 3 link couplings for two reasons. Firstly, my eyesight wouldn't allow me to actually see to uncouple the links. Secondly, the curves forced on me by the layout's size, meant that buffer-locking would be inevitable, at least with the bogie stock. I've also had experience of using the Sprat and Winkle couplings (in my Irish 21mm days) but I wasn't too keen on the metal bars that I would have had to fit across the buffer heads to stop buffre-locking. Thus I started to fit Kadee couplings to my slowly growing stock of models. As detailed elsewhere on this website I soon found I had problems, largely I suspect because of the slop in the axle ends and the short length of the wagons. Frequently the couplings didn't quite couple with the couplings not engaging properly. Also I found that the short wagons often bridged the magnetic ramps and uncoupled at both ends. In the end I removed all the Kadee couplings, except those within the rake of bogie passenger coaches, and replaced them with the new Bachmann type. I simply glued these to plasticard blocks under the buffer beams of the wagons. I then strengthened the joint with Araldite. I found no problem fitting them, in ythe same way, to either the bogie coaches or to any of my locomotives. The front face of the coupling bar stands about two millimetres clear of the buffer heads. This seems to be sufficent to allow the coupling bar to buff against its neighbour without allowing buffer-locking. The freight rolling stock has one of the coupling hooks removed so I have to place the stock on the layout with the hooks facing the same direction. The two 4-4-0 passenger locos have both hooks removed since I've left a hook on each end of the passenger train rake. 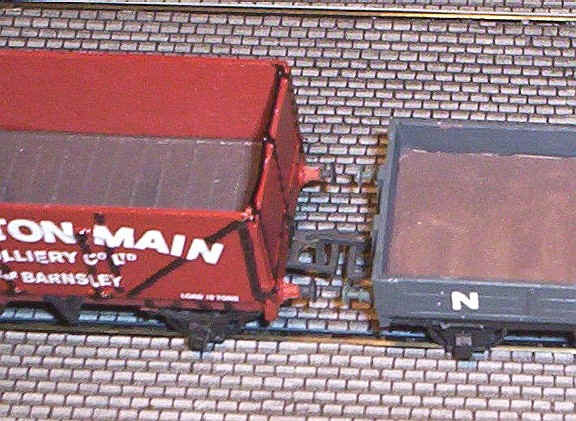 The 0-6-0 has hooks on both ends so it can shunt wagons from both ends. I still wanted to be able to uncouple the vehicles easily and here is the "clever" part. I simply super-glued a 5mm length of steel paper clip wire to the outer face of the coupling hook, later painting it black. Uncoupling is carried out using a small magnet attached to a length of plastic which raises the coupling hook whenever needed. In practical use I've found that the system works with almost 100% reliability. I can uncouple anywhere on the layout and shunting is a real pleasure; leisurely and enjoyable. The only problem I've had is that one or two of the couplings haven't been set at quite the correct height. Occasionally the buffing surfaces override or the hooks don't engage properly. This will be sorted out by building myself a coupling height gauge! 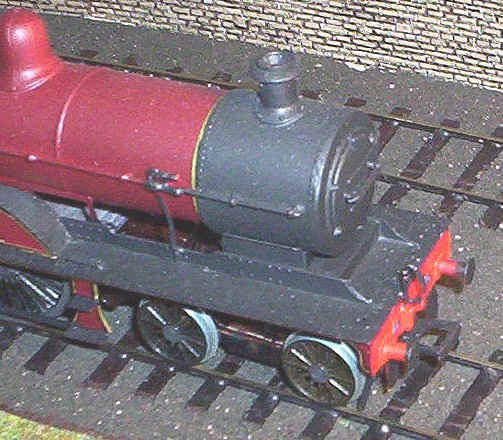 In terms of appearance the tiny size of the coupling in relation to S Scale models makes them almost invisible on the two 4-4-0s (the ones with the hooks removed), whilst they are pretty unobtrusive on the rest of the stock. As can be seen from the photos wagons can be coupled with just 2 or 3mm between the buffer heads. All in all I'm very pleased with the performance of the couplings and intend to stick with this method. It might not be prototypical but it works! The freight vehicles have a gap of about 3mm between vehicles when coupled.